Question: Why should I use Hard Wax Oil rather than A Good quality Varnish such as Mega, Bono Nova etc on my Parquet Floor which I am currently restoring? This is a 5 finger parquet. I have in the past used the above varnish very successfully on in excess of 5 or six pine and oak floors and wonder why you would choose the HWO finish? I would also like to buy your Modern Parquet Floor Adhesive to re-install a few loose 'fingers' that have become loose-do you deliver to the Saltdean area of Brighton? Thanks for your help, I enjoyed your web pages. Thank you for your question. You are absolutely free to choose whatever finish you like, if you prefer varnish then who are we to stop you? We prefer an oil (HardWaxOil for Oak, single oil and wax-polish for tropical species) because in our and many of our clients experiences it is easy to apply, and brings out the character of the wood much better than a varnish. Oil allows the wood to breathe while it is protected against dirt and drips. Also, damages can be repaired locally without having to sand the whole floor to prevent patches where new varnish overlaps old varnish. What wood-species is your parquet floor? If you only have a few loose blocks/fingers, grip-fill can be used. No need to purchase a minimum tub of 7.5 F.Ball B91 adhesive. Hello Karin, Thank you very much for your quick and candid and very informative reply - nothing like a direct answer I say. I didn't mean to portray myself as a Smart Alec but re-reading my email I see that I could have been more friendly. I'm sorry for any offence. 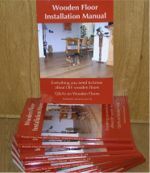 As authors of the Wooden Floor Installation Manual we are always eager to hear how DIY-ers get on with installing their wooden floor with a little help from our manual. Through our online "Ask Advice" form we received a question about using a specific underlayment from a Dutch manufacturer. The DIY-er in question, Martcho based in South-East England, was strapped for time and could therefore not level out his whole floor using self-leveling compound, just small parts. To get the floor more level in the quickest of times, he needed the special underlayment to try to diminish the problem. The only product seemingly available in the UK from this manufacturer was in our opinion more suited for laminate flooring than for the wood-engineered floor Martcho was planning to install. It is almost complete, the screed was dry, but not as level as wanted or hoped. The flooring is laid, cut the doors next week, put the skiring and the rest of the door mouldings and voila - job done. I managed to get the Paladin underlay as you advised. The floor seems to sag a bit here and there but I hope not too much. I guess it will settle a bit and with the weight of the furniture. And it looks fantastic. The missus is very happy. It does create a very lively floor though. If you purchased the "Wooden Floor Installation Manual" too (paperback and/or E-version) and have finished your floor, you're also more than welcome to submit your pictures. We are creating a growing "show-case" of DIY results with a little help from our manual. As stated in our manual: installing a wooden floor is not rocket science, and these show-cases are the proof in the pudding. Prime Oak in the design pattern Large Plait, surrounded by Prime Oak 'Soldiers' (a perpendicular border). I certainly learnt as I went and used your advice and DIYNot postings on a regular basis. Thanks very much for all your help with our order"
Congratulations to our winner, the price (1 free maintenance product) will be on its way to Plymouth shortly. (John tells us the floor looks even better in real life, the picture doesn't do it the justice it should according to him). The floor is a Duoplank Mammoet "Oeral": wide boards, aged, smoked and oiled natural. You can read John, Caroline and Nick's story in our DIY-triumphs gallery here. Congratulations, the maintenance product of your choice as price is on its way to you. Need help on preparations and want to learn the tricks of the trade before you start your project: check out our Comprehensive Installation Guide. 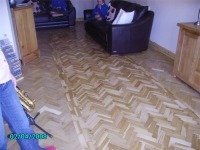 His triumph - a 10 day labour of love (read his whole story) - is a lovely restored Oak herringbone parquet floor (see pictures below) and he can now select a suitable maintenance product as prize. helps you on your way. Did you install a wooden floor yourself and are you Darn Proud of it? Honest and high quality products together with honest and high quality information is always a winning combination. Our own growing band of proud DIY-clients - as far as Scotland - show that time after time. Installing a natural wooden floor is a labour of love - you'll have to take the right preparations, make sure you have all the right materials and tools at hand and you'll have to take your time: this is not something you can rush. Not if you want a result to be proud of and one that will increase the comfort and the value of your home. Our own webpages are filled with honest high quality products and high quality honest advice for everyone. We are always more than happy to answer any remaining questions and have installed a very simple online question form for this very reason. Every time we finish the installation of a wood floor for one of our clients we leave the job with proud feelings and experience tells us that most of our clients who install their own floor feel the same. Job well done! We are now giving every DIY-er the chance to show-off their DIY-Triumphs in our dedicated photo gallery. Wood You Like is inviting you to enter our "DIY-Triumph"
UPDATE 01.07.2010: contest is now closed for new entries. But...... the gallery is still there as a show-case of DIY-ers who used the Wooden Floor Installation Manual to assist in the installation of their floor. The gallery (and this category "Hall of Fame") shows the pictures of the end-result and where possible a story behind the installation. Did you install your own wooden floor with help of the Wooden Floor Installation Manual? Then feel free to email us your pictures and story.